We are pleased to announce several updates regarding the 17th annual SITAR conference to be held June 6-7 in New Haven, CT. Detailed information can be found at http://sitar2014.weebly.com/ or by contacting me at hopwood2@msu.edu. Dr. Geraldine Downey is a Professor of Psychology and Director of the Social Relations Laboratory at Columbia University. She studies interactions between individuals, how these interactions regulate needs for contact and autonomy, how they relate to psychopathology, and how they are affected by situational factors. She concentrates on patterns involving rejection sensitivity, in which individuals anxiously expect and perceive rejection from others. Dr. David A. Kenny is Emeritus Professor at the University of Connecticut. His research focuses on social science research design and data analytic methods, with a special emphasis on the analysis of dyadic and group level data. He has developed several widely applied statistical approaches, such as the Actor-Partner Independence and Social Relations models, developed a number of statistical scripts, tools, and guides to facilitate data analysis, and has conducted applied work tackling range of topics in social, personality, health, developmental, and clinical psychology. 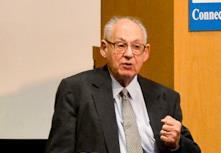 Dr. Sidney Blatt, Emeritus Professor of Psychiatry at the Yale University School of Medicine, has been a major figure in interpersonal psychology, having developed a major theoretical perspective on variability in depression that focuses on unmet needs for autonomy and connectedness. This perspective, and his Depressive Experiences Questionnaire have been widely influential in clinical psychology for several decades, and his work has directly impacted SITAR intellectually as well as through the memberships of several of his students since we have been a society. We are very pleased that Dr. David Zuroff has pulled together a series of talks highlighting his work. Most of all, we are thrilled that Dr. Blatt plans to attend the meeting and discuss his work with us. As always, this year’s scientific program includes a diverse range of themes relevant to interpersonal psychology by authors from around the globe. Topics include social behavior, personality, psychopathology, psychotherapy, development, organizations, marketing, multicultural psychology, test development, and research methods. The program also features two panels involving the assessment of interpersonal dynamics using a joystick device and interpersonal factors in depression in the context of close relationships. Details about the program are available at http://sitar2014.weebly.com/.